So far, we've established that painting a model rocket can add significant weight. We've also established that added weight can have a negative impact on the altitude we can expect from a given model. Comparing simulated flights between our heavier, painted Estes Monarch with the lighter, unpainted Monarch showed this difference. Then, in Part 2, we took a detour to discuss aerodynamic drag - the resistance our rockets encounter from the surrounding air. By comparing flight simulations of our smaller, 3-finned Estes Monarch with the larger, 4-finned Big Bertha, we saw that, even though a lighter rocket will usually fly higher than a heavier one, drag is significant enough a force to change that; the larger, draggier Big Bertha simply cannot catch up to our finished, painted Monarch, even if we change the weight of the Bertha so that it matches that of the 25% lighter, unpainted Monarch we've been looking at. What about two rockets of the same design - exactly the same size and shape - but one is heavier and one is lighter? One is painted, and the other isn't? All things being equal, a lighter model rocket will usually fly higher than a heavier one. We saw that in our flight simulations from Part 1 of this series. The exception to this is if the rocket is far too light - below the optimal mass for its size and shape. A featherweight rocket may not have enough inertia to overcome the drag holding it back. Remember our comparison of throwing a bowling ball, a baseball, and a foam rubber ball up into the air. But since most model rockets are probably heavier than they need to be even before building, you probably won't encounter that problem*. But when you paint a rocket, all things are no longer equal. 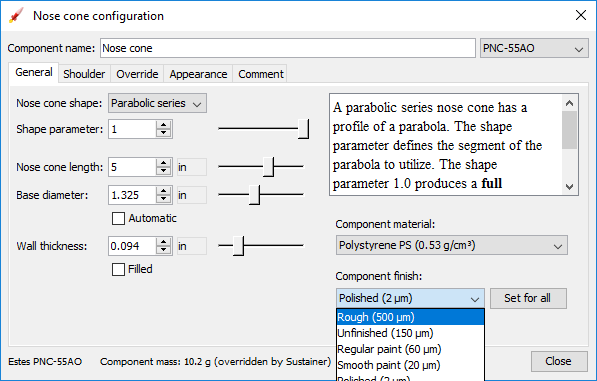 When you use OpenRocket to design a rocket or build a simulation of an existing design, you start with the nose cone, and add parts one by one. All parts will have default settings - such as weight and center of gravity - depending on what they're made of and how thick they are. 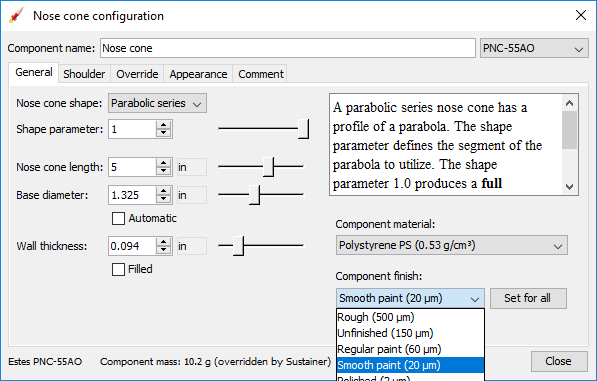 The default setting of each part for surface texture is "Regular paint," and is followed by the number 60 and the symbol μm. This represents the average roughness height of the surface, and is measured in micrometres, or microns. 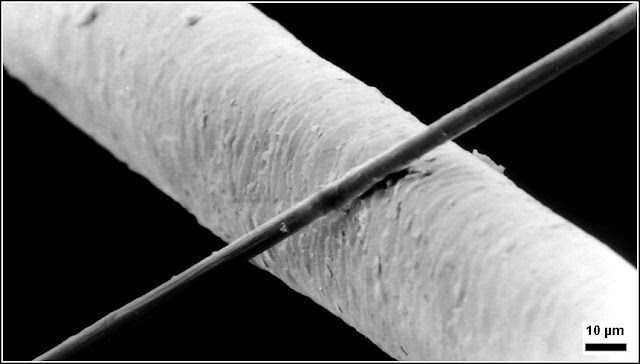 A micron is 0.001 millimeter - very tiny. Here's a photo of a carbon fiber filament - only six microns in diameter, compared to a human hair, about 50 μm in diameter. So, in OpenRocket, if you change nothing about the surface texture, the assumption is that the rocket is painted, and that the tiny bumps in the paint job are, on average, 60 μm high. 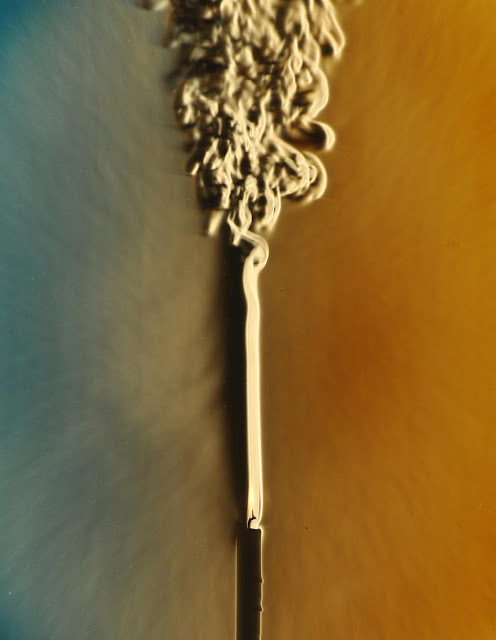 Rough surface texture creates more turbulent airflow over the rocket, which in turn increases drag. Another thing increases drag dramatically - the velocity of flight. It might make sense that drag goes up as speed goes up. 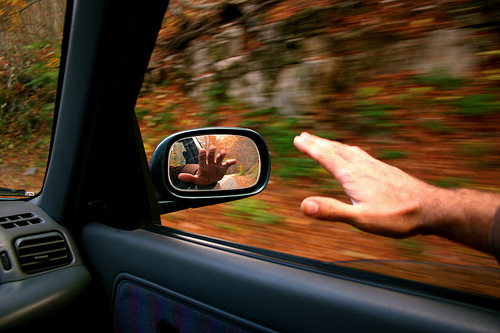 If you stick your hand out a car window while traveling at 20 miles per hour, the force on your hand is very light, while at 60 miles per hour, the wind pushes hard on your hand. But here's the thing: while drag from laminar flow increases proportionally with airspeed, drag from turbulent flow increases as a square of the increase in velocity. That means if you double the speed of the rocket, drag goes up four times. If you triple the rocket's speed, drag increases nine times. You can see the need to decrease the amount of turbulence the rocket experiences. That's what a smooth paint job can do - decrease turbulent airflow. We've seen how a heavy paint job adds weight, and how added weight reduces altitude. 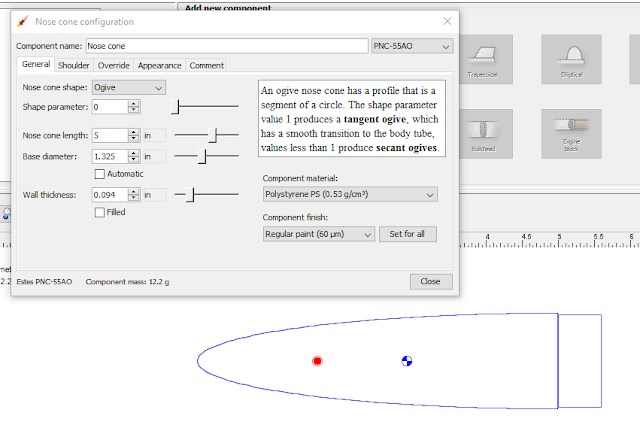 But to see how the surface texture of paint affects drag, we need to factor that into our simulation. 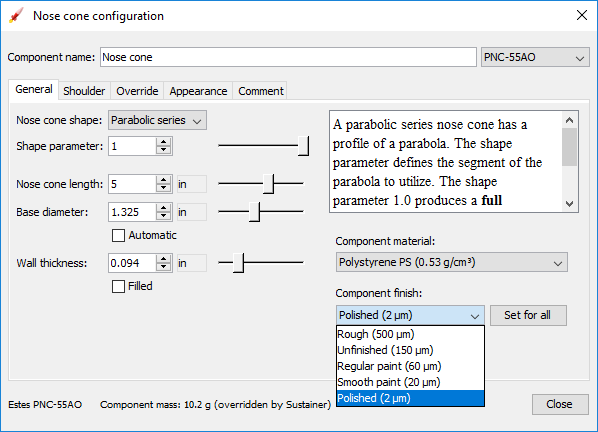 Returning to the unpainted Monarch simulation, I click on the nose cone and select "Unfinished," then click the box that says "Set for all." Now all components of the simulated rocket - the nose cone, body, fins, and even launch lug - have a simulated surface texture with an average height of 150 μm. Here, we should note something. A lot of things in OpenRocket are approximations, and this is a good example. Obviously, all unfinished materials don't have the same texture. An unfinished plastic nose cone is smoother than a balsa cone, with its exposed wood grain, and a set of raw balsa fins are rougher than an unpainted paper body tube with a slick coating. But I think this is good enough to illustrate the principle we're talking about here. Also, the altitudes are approximate. You might find you get a different result each time you run a simulation. We'll go into why another time. How do I know how good my paint job is? I don't have a means of measuring the surface roughness in microns. But I know that my paint job isn't polished, and the paint didn't go on as smoothly this time as I've managed in the past. There's a bit of visible texture. There are little bumps. But, they're smooth bumps, and I've seen and done far worse. So, I'm calling this "Regular paint." It's a guess, but, I think, a fair one. Our original simulations from Part 1 showed the lighter Monarch beating the altitude of the heavier Monarch by a significant margin: 89 feet higher on an Estes C6-5 motor, and 42 feet higher on a D12-5. The fact that the margin narrows with the D12-5 can be attributed to the fact we discussed before, that drag increases exponentially with velocity. On the D12, the both rockets fly nearly 100 miles per hour faster than on the C6. The lighter rocket still wins, but the drag force is significant enough to narrow the gap. Now that we've got both the mass and the surface texture adjusted for the Monarch before paint, let's run a new flight simulation. Remember, the unpainted rocket weighs 57.4 grams, and the smoother, painted rocket weighs 75.8 grams - over 32% heavier. With a rougher, unfinished surface texture, the unpainted Monarch has lost some altitude. It still beats the heavier Monarch on a C6-5 motor - this time by 53 feet. But on the D12-5 motor, the smoother, painted rocket now wins by 27 feet! Why is this? Again, look at the maximum velocity of the models. On a D12 motor, the rocket flies 94 miles per hour faster than on a C6-5 motor. The increased drag at higher speeds works to stop the rocket short of the heavier Monarch's peak altitude. What if we got a better paint job on the Monarch? What if our paint job was good enough we felt comfortable calling it "Smooth paint," with an average surface roughness of only 20 microns? Now how high does the rocket fly? By decreasing turbulent airflow even further with a smooth paint job, we increase our altitude even further, nearly catching up with a C6 motor, and breaking 1,100 feet with the D.
What if we carefully polish the finish on the paint job, and get it nearly perfect, with a mirror-smooth finish of only 2 microns in average height? Now we've increased our altitude on this rocket even more. But we still haven't caught up to the lighter rocket flying on a C6-5 motor. That paint job is just a little too heavy. Let's look at the flip side to all this. What if we could paint the rocket nice and smooth, and the paint weighed absolutely nothing? Let's take our "unpainted" Monarch, give it an imaginary paint job with no added mass, and polish it smooth. What kind of altitude could we expect from a lighter but smoother rocket? Now we've gained some serious altitude. By keeping the rocket light and making it as smooth as we can, we're giving the rocket the advantage in overcoming both gravity and aerodynamic drag. We've taken this little sport rocket and pushed it to perform its best. Of course, paint doesn't weigh nothing. We're always going to add some mass. But we can try to minimize that. The Monarch isn't a high-performance model, with its goofy, oversized, 1/8-inch-thick fins, but that doesn't mean we can't make the most of it. What if we painted the rocket with real paint - and, as happened in the case of my rocket, the paint went on a bit heavy - but instead of a nice, smooth paint job, we got something less than desirable? Sometimes, a paint can will have chunks of pigment settled in it, and you'll end up with a paint job that's really spiky and rough. The paint came out of this can like it was Silly String. When my friend Chad moved across the country, he gave me his rockets. I picked one up, and it actually hurt - the texture was like little needles. The surface was as if it were covered in tiny claws for grasping at the air as the rocket flew. What if that were the case with our painted Monarch? 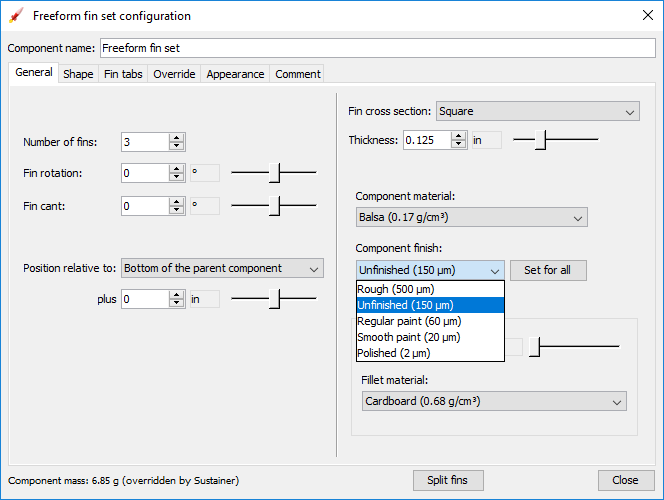 Let's select a "Rough" finish, with an average height of 500 microns. Here we see how paint can be a hindrance, if done badly. Not only will the rocket not look nice, it won't fly as high. So, if you want to get the most performance from a model rocket, the key is to build light, and make the surface smooth. I build most of my rockets to look nice. I take a few steps in the hopes that they'll perform a little better, but I don't always try to maximize their altitude. That's certainly true of the Monarch. This all started with a simple question in my mind: How much weight am I adding by painting the rocket? But now that I see the results of our simulations, something's bugging me. The painted Monarch can't match the unpainted one on a C motor - only on a D - even by reducing the drag and making the paint as smooth as possible. But the Monarch was never meant to fly on D motors. The only reason mine can is that I set the kit motor mount aside and upgraded to a larger mount. What if I want to paint the rocket, but I also want it to fly as high as it can? The key is to paint lighter and maybe smoother. How much lighter? And can it be done? And how can it be done? I've promised to answer these questions the last two posts. Next time, we'll actually look into it. *There are some exceptions to this. 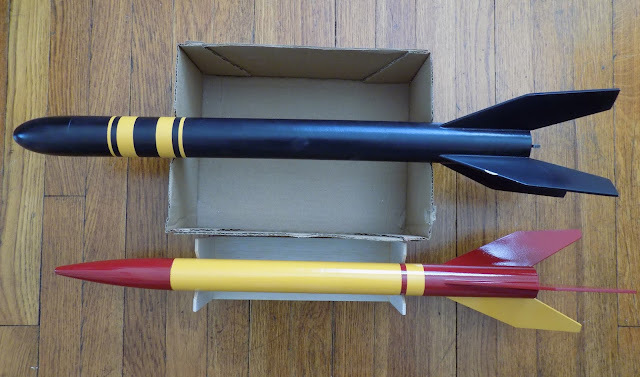 Model rocket have been made from things like Styrofoam, pool noodles, and even Mylar balloons. These rockets are so light they don't coast very much after motor burnout. Such model rockets are some of the few which would probably benefit from a little added weight. But, then, such rockets are meant to fly to relatively low altitudes, even on higher thrust motors. Apparently, I make a certain noise at launches. I've started shooting a series of model rocket build videos for my YouTube channel, beginning with a rocket from Quest Aerospace - the Superbird. This one should be interesting. What started as a rather straightforward build has developed a few hiccups early on, making things a little more complicated than they should be for a really simple model rocket, but I think that's a good thing. Rather than being a series which might be a little boring for anyone but an absolute beginner, it will involve a little creative problem solving. Please subscribe if you'd like to see more. 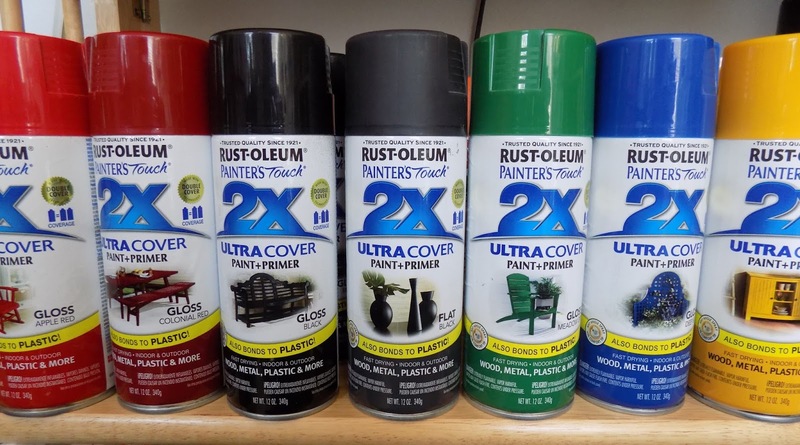 The Weight of Paint - Part 2 - So Why Paint? In the last post, we saw how much weight paint can add to a model rocket, and how that weight might affect the rocket's flight. The Estes Monarch I recently built has a total weight of 75.8 grams - 25% of which is just paint and primer. And an OpenRocket simulation of flights of both the painted and unpainted rockets showed a significant loss of altitude in the heavier, painted version. So, this begs the question: Why paint rockets at all? There are two good reasons. It may seem obvious - the main reason we paint rockets to make them look nice. As Chris Michielssen rightly pointed out in the comments section of the last post, not every rocketeer is concerned with maximizing altitude. A small loss in altitude is worth it to get a nice-looking rocket. Some people actually prefer a rocket with a slower liftoff and lower apogee. They enjoy the spectacle of a dramatic launch, and want to see the whole flight. A high-flying rocket can be hard to spot when it's at altitude, and for some people, that's not as fun. A larger, lower-flying rocket is often referred to as low and slow. The Estes Big Bertha is one of these. Some people do "fly naked," as it's called - they enjoy building and flying rockets, but skip the step of painting. As a result, they're able to finish rockets more quickly, and their rockets are certainly lighter as a result. Others will build the rocket and wait to paint until they've flown the rocket once. The rocket must "earn its paint." They want to see how well it flies and how little damage it will accrue before taking pains to give the rocket a nice finish. I have a hard time doing this, though. If the rocket gets some minor damage in flight, I know I'll have a hard time giving it the finish I like, and I want the rocket to look great - at least once. For me, building a rocket is part science project, part art project. I do want the rocket to perform well - as well as it can for its design. But I also want it to be pretty. A model rocket or high power rocket is a beautiful, sculptural object. Since it spends more time on a shelf at home than it does flying, I want it to make the place look nice. It adds an unexpected decorative element to my home. ...a fleet of beautiful, colorfully-painted rockets. This always inspires questions and gives me a chance to talk about the work I've done on them. A shelf full of unpainted rockets might not have the same effect. Most of the kits you buy are sport models - not competition rockets - so you can only expect to get so much altitude from them. The Monarch I've chosen to focus these blog posts on is certainly not designed to be a high flier. But even if you're building an Estes kit, perhaps you want to see how much performance you can get from it, even if it's not really a "performance rocket." Based on the information from the previous post, you might then think that it would be better to save wait and not paint the rocket. But this brings us to our second benefit of painting a model rocket: drag reduction. 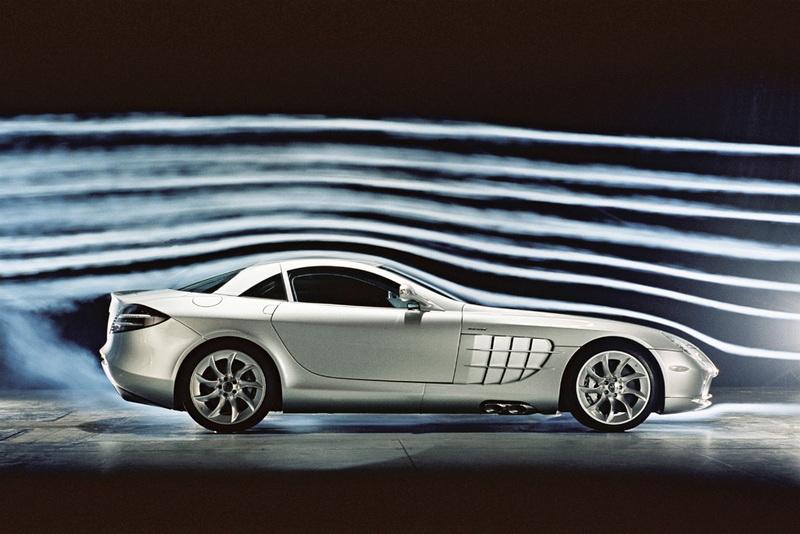 Let's take a brief detour and discuss aerodynamic drag. Try this little experiment. Take a sheet of paper, and crumple it loosely into a ball, like this. Now, sit on the floor, and see how high you can throw it upwards. Try to hit the ceiling. I certainly couldn't. But now take the ball and wad it much tighter, like this. Try throwing it now. This time, I hit the ceiling, no problem. The paper weighs the same, so the effect of gravity on it is the same. But the first time, it was difficult to throw. In fact, if the paper had weighed even less, it would have been even harder to throw. The difference between the two throws is the air - a force known as drag. Drag is an aerodynamic force acting opposite the direction of a moving object. It's also sometimes called air resistance or wind resistance. As a rocket flies upward at high speed, the surrounding air exerts a force to slow it down. 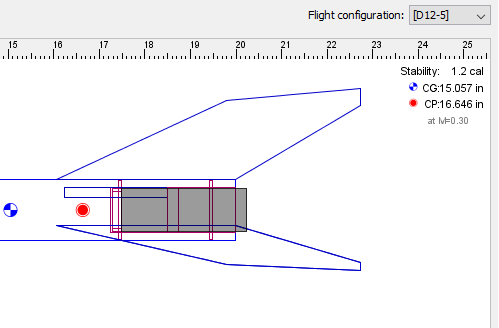 It may not seem like it should have much of an effect, but the drag force can be quite significant on a model rocket. There are several types of drag working against a rocket as it flies. Pressure drag, also called form drag, is the result of high air pressure at the forward or front end, and low pressure on the aft or back end. A rocket speeding through the air will compress the molecules of air in front of it, causing an area of high pressure on the nose cone, the leading edges of the fins, the leading edge of the launch lug, etc. When the rocket passes through the air, behind the rocket - and on the trailing edges of the fins, launch lug, etc., is a partial void or vacuum - an area of low pressure. 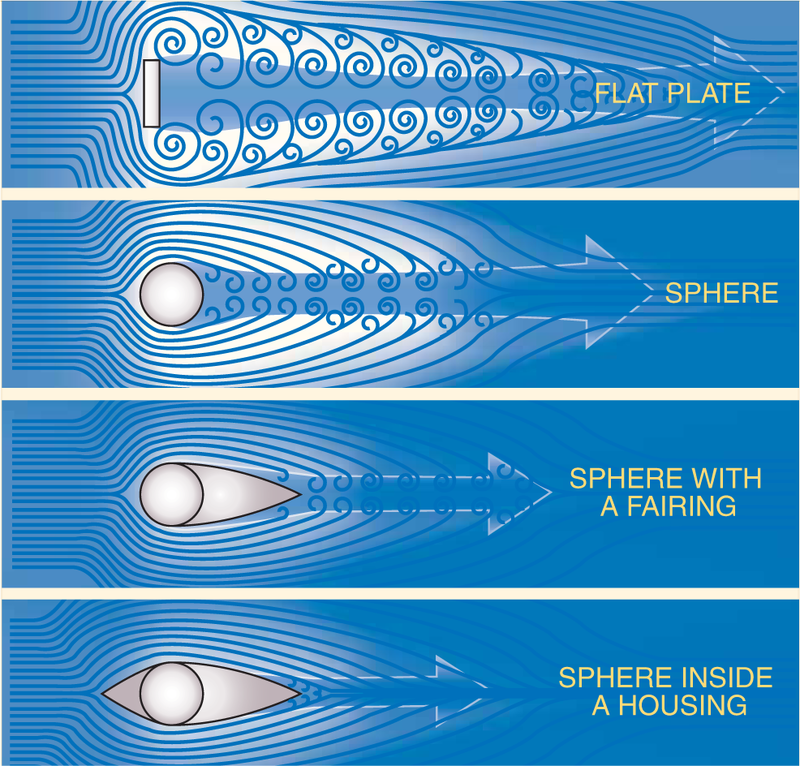 Once the rocket has passed a region of the air, the air flow separates from the rocket, and the molecules rush to fill in the empty space behind it, causing turbulence and drag. Pressure drag has to do largely with the shape of the rocket - the shape of the nose cone, whether the fins are left square or streamlined by the rocketeer - as well as the size of the rocket. A fatter rocket will have more pressure drag than a skinny one, because the wider diameter means that there's more area of high pressure at the front and low pressure at the aft. What stopped our loose paper ball from hitting the ceiling in our experiment was, largely, pressure drag. Induced drag is caused by the fins, and it is due to the lift force. Lift, on model rocket fins, works to correct the rocket in flight and keep it stable. If something causes the rocket to waver or wobble in flight, the fins will experience high pressure on one side and low pressure on the other. That's lift, and the pressure will cause the rocket to rotate back around its Center of Gravity (CG) and straighten in out again. Lift acts perpendicular to the rocket's fins, and it's necessary to keep the rocket stable. But with lift comes drag - at a 90 degree angle to the lift force. Again, high pressure on the leading side of the fin and low pressure on the trailing side of the fin, while it corrects the rocket's trajectory, also causes increased drag. Lift and drag - in this case, on an airplane wing. Image from The Recreational Aircraft Association of New Zealand wiki. Skin friction drag has to do with the air flowing over the entire surface of the rocket. 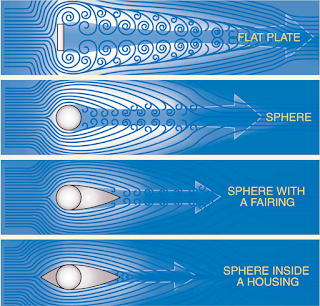 Smooth airflow - known as laminar flow - creates less air friction than rough or turbulent flow. The layer of air right next to the rocket is called the boundary layer, and the viscosity of the air plays a large role here. A laminar boundary layer is nice and smooth, whereas a turbulent boundary layer is full of swirls and eddies. In laminar flow, the layers of air slide easily over one another. Not so in turbulent airflow. The layers swirl and mix together chaotically. Flow will always go from laminar to turbulent. 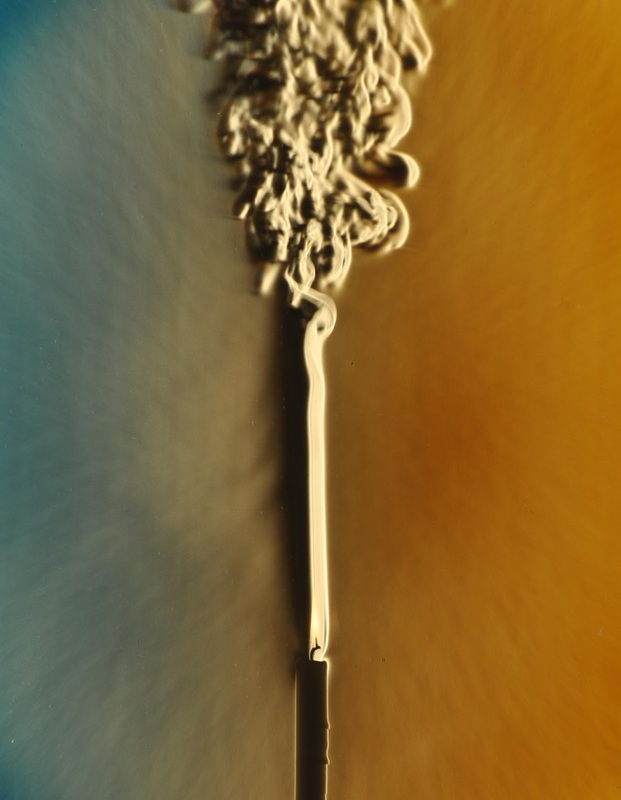 The plume from a candle going from laminar to turbulent flow. From Wikimedia Commons. This is especially true at higher velocities. The faster the rocket flies, the more turbulent airflow the rocket will experience. The Handbook of Model Rocketry describes an experiment to illustrate this. Turn on your kitchen faucet. If you turn the water on only a little, it comes out in a smooth stream. If you increase the flow of water, the flow is smooth for a bit, but by the time it hits the basin of the sink, it has changed from laminar to turbulent flow. And if you turn the water on full blast, nearly the whole stream will be turbulent. Skin friction drag can be pretty significant, and if you want to fly higher, you want to reduce the amount of turbulent airflow over the body of the rocket. The boundary layer will always transition from smooth to turbulent somewhere along the rocket, but the trick is to try to make the effects of turbulent flow less dramatic. You've probably had the experience of riding in a car with your hand out the window. If you face your palm flat into the wind, it will push hard on your hand. But if you flatten your palm out and hold it parallel to the ground, like an airplane, there's much less wind resistance on your hand. If you then tilt your hand slightly upward, the air will push your hand up toward the top of the car. Tilt your hand downward, and your hand goes down. As a kid, I used to let my hand move up and down in waves like that while riding in the passenger's seat of the car. The strong force you feel on your hand with your palm open to the wind - that's pressure or form drag. It lessens dramatically when you point your hand directly into the wind like an airplane. The force moving your hand up and down as you tip it up or down, making waves - that's lift! ("Lift" doesn't mean upwards, by the way. Even when your hand is tilted downwards and the air pushes your hand toward the ground, that's still the lift force.) While your hand is moving up or down, you feel increased air pressure pushing your hand backwards - that's induced drag. And the feeling of the wind on the hairs on the back of your hand - that's friction drag. So, when we launch a rocket, we're not just fighting gravity to achieve altitude. We're also fighting drag. A lighter model rocket will tend to fly higher than a heavier one, because most models are probably heavier than they need to be to achieve the highest altitude possible for their profile, on the motors with which they'll fly. But mass alone isn't the only determining factor in altitude. Let's look at an example of a rocket which weighs the same as our painted Monarch - the Estes Big Bertha. The Monarch's fins are reminiscent of the Bertha. But the Bertha is larger - over an inch taller, larger in diameter, and with four fins instead of three. The Bertha's fins are also slightly larger. My Big Bertha weighs almost exactly the same as my Monarch. It may be a gram or two heavier, but they're pretty close. But I didn't paint my Bertha as heavily as I did the Monarch. If I created a simulation of both rockets, identical in weight, how would they differ in performance? Let's do a comparison. Like I did with the Monarch, I'll simulate flights with both the Estes C6-5 and D12-5 motors. First, let's review the flight simulations of the heavier, painted Monarch. 599 feet on a C6-5, and 1054 feet on a D12-5. Here are the results of the Big Bertha simulation flights. Despite the fact that both rockets are of the same mass, the Bertha can't match the altitude of the Monarch. The reason is drag. With a larger diameter and four fins instead of three, the Bertha has more pressure drag. And with the increased surface area, due to the rocket being over an inch longer, plus the larger diameter, the fourth fin, and the fact that the fins are larger than those on the Monarch, the Bertha experiences more skin friction drag. What if we make the Bertha "unpainted," and as light as the unpainted Monarch? 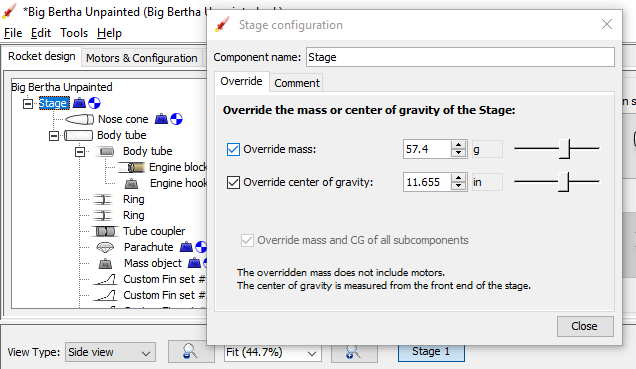 Here are the results of the simulations on the "unpainted" Bertha. Even weighing 25% less, the unpainted Bertha flies a bit higher, but simply has too much drag to compete with our sleeker but heavier Monarch. In this example, the Bertha is our loosely crumpled ball of paper, and the Monarch is our tightly crumpled ball. What Does All This Mean For Our Rocket? 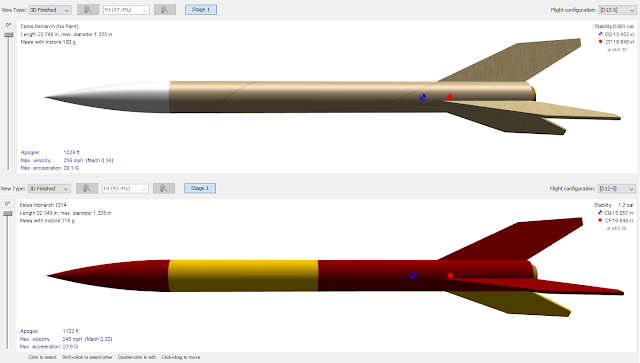 In the previous post, we ran simulations of our lighter, unpainted rocket, and our heavier, painted one. The painted Monarch was over 32% heavier than the unpainted one, and the simulations showed a dramatic decrease in performance for the painted rocket - nearly 100 feet on a C6-5 motor. We've already run a simulation on the painted and unpainted rockets, so we already know which will perform better, right? Pressure drag depends on the size and shape of the rocket, and skin friction drag increases with exposed surface area, so isn't lighter just better? Well, when I built the simulation, there was one important aspect I left out: surface texture. Paint can make a rocket smoother, and a smoother rocket will have less skin friction drag. How will this difference affect the performance between the two rockets? And, can you paint a rocket while still keeping it lightweight? We'll examine these questions in our next post. Today, we're going to look at paint - how heavy it is, and how it may effect a rocket's flight. When I begin building a rocket, I almost always either try to find or make my own simulation file for OpenRocket. I do this for a few reasons. I want to get an idea of how high the rocket will fly on certain motors. Estes rockets always have a list of appropriate motors on the package, but there are others available, and I want options. Many rockets not sold by Estes don't come with a list of motors, and you have to figure out for yourself which ones will work. My simulation of Sky Wolf - a limited edition rocket by Sky Pyrates. I have to choose motors myself for this rocket. Sometimes I'll build the rocket with a larger motor tube than comes with the kit, and I want to make sure the rocket will be stable. A larger motor shifts the Center of Gravity (CG) toward the aft end, which affects the static margin - the distance between the CG and the Center of Pressure (CP). Those two points need to be a minimum distance apart - the diameter of the airframe or body tube - in order for the rocket to fly safely. Estes Cosmic Explorer, upgraded from a C-sized motor mount to an E-sized mount. I had help with this one, by Rocketry Forum user K'Tesh. I might decide to add a booster to a kit, transforming a single-stage rocket into a two-stager. 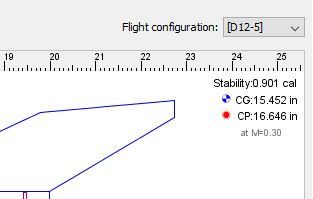 And again, I need to see how this will affect the CG/CP relationship, and the altitude of the flight. An Estes Hi Flier XL, with a booster I designed myself. The booster was left over from a rocket I lost a couple years ago. And, of course, if I design my own, I'll start with OpenRocket. In that case, there are no instructions to follow, no list of motors, and no idea about how long a delay I'll need with a particular motor. When I build a simulation, I carefully weigh all the parts, and input them into the simulation. That way, I can see where the CG and CP should end up on the final rocket, and see how the rocket might be expected to perform. However, once the rocket is built, everything changes. Everything you add to a rocket when building it adds weight, and may also move the CG. This includes glue for attaching fins and launch lugs, glue or epoxy used for fin fillets, and - very significantly - paint. Added weight affects the performance of the rocket. Generally, a lighter rocket will fly higher than a heavier rocket - up to a point. There is an optimal mass for a rocket, and it depends on a number of things, including the shape and size of the rocket and the motors used to fly it. High flying rockets tend to be pretty light. But there is such a thing as too light for maximum altitude. There are two forces working against a rocket in flight. One, of course, is gravity. The other is drag, or wind resistance. A heavy rocket will have a problem flying high, because the motor only has so much energy to work against gravity. A super light rocket, while it will be much less work for the motor, doesn't have as much inertia, and drag will slow it down more easily. Imagine throwing a ball straight up into the air. You can throw a baseball much higher than a bowling ball, because the baseball is much lighter. 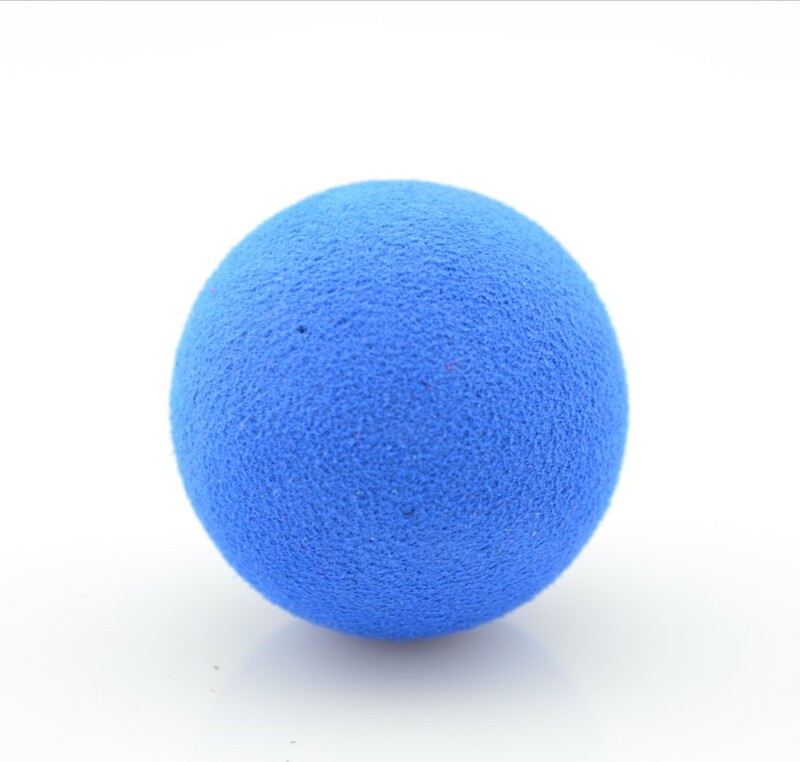 But if you try to throw a really light foam rubber ball into the air, it won't go very high at all - it doesn't have much inertia, and the air has no trouble slowing it down. Ever try to throw a feather? It doesn't go far. Nevertheless, most model rocket kits are probably heavier than they need to be for maximum altitude, so for performance, it's best to build light. It may seem obvious that spray paint will add weight to a model rocket - but how much? This was a question I had recently. I hadn't started a new rocket in a while, and I wanted to build something simple. From my build pile, I grabbed the Estes Monarch, a simple rocket I'd purchased during the holiday clearance sale from the Estes website a couple of years ago. The Monarch is one of those rockets which are larger than they seem when you see images of them online. At 1.33 inches in diameter, it stands over 22 inches tall. It's a larger, but not enormous, low power model rocket, and I decided it was a good one to work on finishing techniques with. I also thought I'd try to find out how much weight I tend to add when I paint. 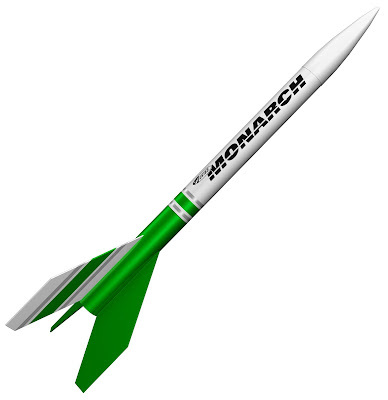 With an 18mm diameter motor tube, the Monarch is a B-C powered rocket. According to the face card, it should fly to an estimated 700 feet on a C6-5 motor. With its large, swept back fins, I thought it would make an easy conversion to 24mm D motors. But whenever you upgrade a rocket like that, you want to make sure it will still be stable. I also wanted to know how much more altitude I could expect with a D12 motor. So I carefully built a simulation in OpenRocket. After building the rocket, I weighed it. First, I weighed it with just the fins glued on, before adding any fillets or wood grain filler - which would make the fins smooth and prevent the wood grain from being seen through the paint. The nearly finished rocket weighed in at 56 grams exactly. Then I located the CG on the rocket. I added fillets to the fin roots, using Titebond Molding and Trim Glue - a type of wood glue which dries quickly, is less prone to shrinkage, and resists sagging. This makes it an excellent glue for fillets. Titebond Molding and Trim Glue, capped with an Elmer's Glue-All nozzle. I found this tip on Chris Michielssen's Model Rocket Building blog. Titebond Molding and Trim Glue does shrink a little, so I usually do two or three layers of it, allowing it to dry between each layer. After adding glue fillets, I weighed the rocket again. It had gained exactly one gram, coming in at 57 grams. Adding 1 gram of weight should change the Center of Gravity slightly. I found the new CG. It had moved aftward by just over 1/8 inch. Next, it was time to fill in the wood grain. I usually use Elmer's Carpenter's Wood Filler (CWF) to hide the wood grain on balsa fins. But I'd had some frustration with it recently, and wanted to try out other methods to see what results I could get. A standby which model rocketeers used for decades is something called sanding sealer. It seals the pores of the wood, and allows you to sand the fins much smoother. While CWF is best applied and sanded before attaching the fins to the rocket, sanding sealer can be applied with the fins already glued on. Since sanding sealer is mostly sanded off, I wondered if it added any weight. Even when it feels like it's all been sanded off, sanding sealer fills the pores in the wood. On this rocket, with sizeable fins, sanding sealer added 0.4 grams. The CG moved aftward only a little. With glue fillets and sanding sealer, the CG has moved aftward less than 1/4 inch. With glue fillets and sanding sealer on the fins, the rocket has gained only 1.4 grams, and the Center of Gravity has moved less than 1/4 inch toward the tail. The one thing I haven't learned from this build so far is how much weight is added by the glue attaching the fins to the rocket. Obviously, you need to glue the fins on, but if I'd been really diligent about weighing all the parts before building - something I normally do - I'd know how much the glue itself weighs. Nonetheless, now we have a rocket which is built, but which is unpainted. It weighs 57.4 grams. Time to run a simulation to see what kind of altitude I can expect. I'll override the mass of the rocket, so that my simulation matches the real thing - 57.4 grams. Then I'll run two simulations simultaneously - one with an Estes C6-5 motor, with which the rocket is designed to fly, and one with a D12-5 motor, since I've enlarged the motor mount. I've also overridden the CG on the rocket, and here's something interesting, which we'll look at again below. You see where it says "Stability:0.901 cal?" That's the static margin of stability when a heavier D12-5 motor is installed. "Cal" is short for caliber, and it refers to the diameter of the body tube. This rocket is 1.33 inches in diameter. 1 caliber stability would mean that the Center of Gravity (CG) is exactly 1.33 inches forward of the Center of Pressure (CP). 0.901 caliber means that the CG and CP are closer together than 1.33 inches - and the minimum safe margin of stability is 1 caliber. So far, with the rocket built this way, the D12 shifts the CG back far enough so that the rocket may be understable. This is one reason I always make a simulation, especially when modifying a kit in any way. But, we'll get back to this down below. On a C6-5, the rocket hits 688 feet - very close to what the Estes face card tells us. With the D12-5, the Monarch soars to just under 1,100 feet, with a top speed of 255mph! Very nice! But now, it's time to paint. For primer, I went with my standby - Rust-Oleum Filler Primer - an automotive primer with a high "build," allowing it to fill in imperfections and scratches in the surface below. This was really helpful when using sanding sealer, as opposed to CWF, because while CWF actually fills in the wood grain, sanding sealer simply prevents primer and paint from soaking into the wood. In other words, you may need to apply a few coats of primer and sand carefully to hide all the grain. The filler primer helps fill in any deep troughs in the grain, making the fins nice and smooth. I followed two or three well-sanded coats of primer with Rust-Oleum Painter's Touch 2X Ultra Cover Gloss Marigold, a beautiful golden yellow paint. I allowed that to dry for several days, and finished with an accent color - Rust-Oleum 2x Colonial Red. The rocket turned out simple but lovely. I decided it didn't need any decals. Now it was time to find the answer to our main question - how much does the paint job weigh? 75.8 grams! That's quite an increase in weight. In painting the rocket, its mass increased 18.4 grams - an over 32% increase. Put another way, the paint is just over 24% of the final weight of the rocket. Nearly 1/4 of the weight of this rocket is just the paint job. How is this going to affect the rocket's flight? Let's plug in the new numbers and look at our simulation. First of all, the added weight has actually fixed one of our problems - stability. With the added weight of the paint over the whole body of the rocket, the Monarch is now comfortably at 1.2 caliber stability with a D12-5 motor. Imagine balancing a chop stick horizontally on your finger. Now, if you add a 1 ounce blob of clay to one end, its center of gravity moves so much that to re-balance it, you have to hold the chop stick much closer to the end with the clay on it. But if you balanced a 2X4, a 1 ounce blob of clay would make much less difference. In order to re-balance the 2X4, you'd only have to shift it over a very little bit. The more massive an object is, the less a small amount of weight on one end is going to affect its CG. The added weight of our paint job has taken away the worry about stability on this rocket. If the Monarch had remained understable after painting, I would have fixed the problem by adding nose weight - most likely, by inserting a small amount of modeling clay into the nose cone and ramming into place with a dowel rod. Now, I don't have to do that. Note: These simulations are pretty good, but when altering a kit like this, you always want to check stability on the real thing before you fly! Always measure the CG and CP on the finished rocket - with the motor installed - or simply do a swing test! But how will the added weight of the paint affect our altitude? On the C6-5 motors, we've lost nearly 100 feet in altitude. For lower flying low power rockets, that's pretty significant - for us, it's about a 13% loss in performance. On the D12 motors, we've only lost 42 feet in altitude, down from 1,096 to 1,054 feet, a bit over 3% loss in altitude. With the rather simple paint job I gave this model rocket, I added quite a bit of weight. So, could I have painted lighter? 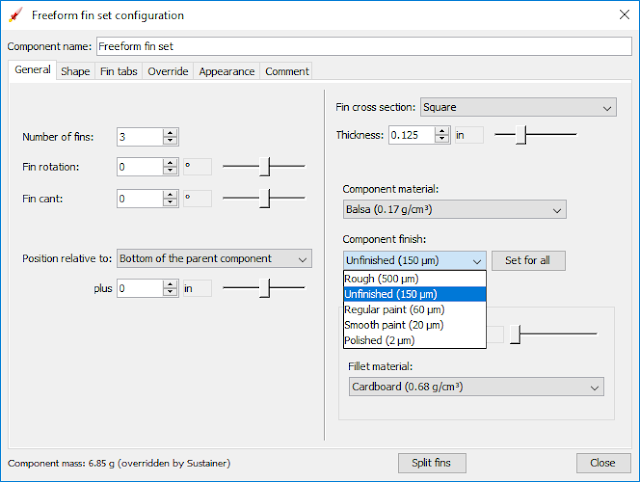 How can we add less weight when we paint? If paint adds weight, and weight lowers altitude, why bother painting rockets at all? We'll go more into this and other stuff in the next post.